This program wraps the libc localtime() and gmtime() functions to output the eternal September 1993 date. The epoch month is configurable (new in version 0.3). sdate works like fakeroot (on which its code is based) by setting LD_PRELOAD to a wrapper library. 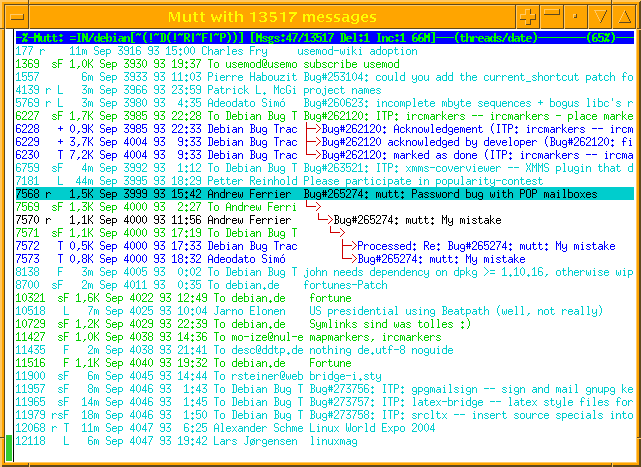 Mutt: works. It will send out septemberfied Date: headers. Depends if you like that. GNU date: works somewhat. date does not fully rely on strftime but does some of the work on its own (for whatever reason) and chokes sometimes. Please tell me your experiences with sdate so I can add the programs to this list.